The office hours of nine to five can bring detrimental harm to the lower and upper back, the neck, and, by proxy, to the head, as staying put for hours at a time in a desk chair facing a barely adjustable monitor ruins your posture. This is even more apparent for taller people. Hunching over the keys to make sure you are typing correctly, or slumping back in one’s seat just to see clearly, make office hours unbearable for those who have to work within them. Standing desks are a brilliant investment for those people in need of back support on the job. Having large amounts of your day being spent sat down at your desk can have serious effects on your back, especially being hunched over the keyboard which is awful for lumbar support. See the major benefits of a standing desk and leaving behind your sedentary lifestyle. If you are in the market for a standing desk converter, one name you might hear often (and for good reason) is the DeskRiser Standing Desk Converter. This review of the product will take you through the pros and cons of this standing desk to give you a fuller picture of what it is that you will be purchasing for your business or office space. Specially fitted ergonomic keyboard tray. Keeps arms at a 90 degree, optimal angle for the average person’s ergonomics. Simplicity in use with only one button with just an up and down adjustment function. Includes one year warranty on Construction and Motor. Compact stature. Fits on and sits atop of your desk. Takes some time getting used to the ergonomic angles. Optimal height for use ranges from 5ft to 6ft 5in. No higher. The distance between the keyboard tray and the monitor platform is fixed. Shipping weight comes in at 61.2lbs, though the item sits at 27lbs. Seated just underneath the monitor station is an ergonomic keyboard tray that allows for your keyboard to sit at the perfect angle to prevent cramp, and it also offers the promise of a more productive level of work. The tray comes already attached to the Electric DeskRiser and the angle can’t be altered which makes it a double-edged sword by way of the pros and cons in its purchase. The tray can be removed from the total apparatus, but it is recommended to keep it affixed so that you start to get used to the magic of a correct angle for typing. When taken away the keyboard can still fit on top of the monitor stand easily. When leaving this feature embedded in the desk, just beneath the main monitor tray, is a great addition as it makes the user work with a level of ease. Aches and pains will become a thing of the past and your productivity is sure to increase without having to worry about sore wrists and hands. The Electric DeskRiser does not want to bore you with needless buttons and knobs that tilt this and adjust that. Instead, it offers all that should be offered in a standing desk converter; the simple flick of a switch to allow the product to rise to a certain height and to lower itself back into its original rest position. This is very special for a standing desk converter, as most others have a form of hydraulic or spring manual lifting. The implementation of electric lifting to the DeskRiser really makes it stand out from the competition. 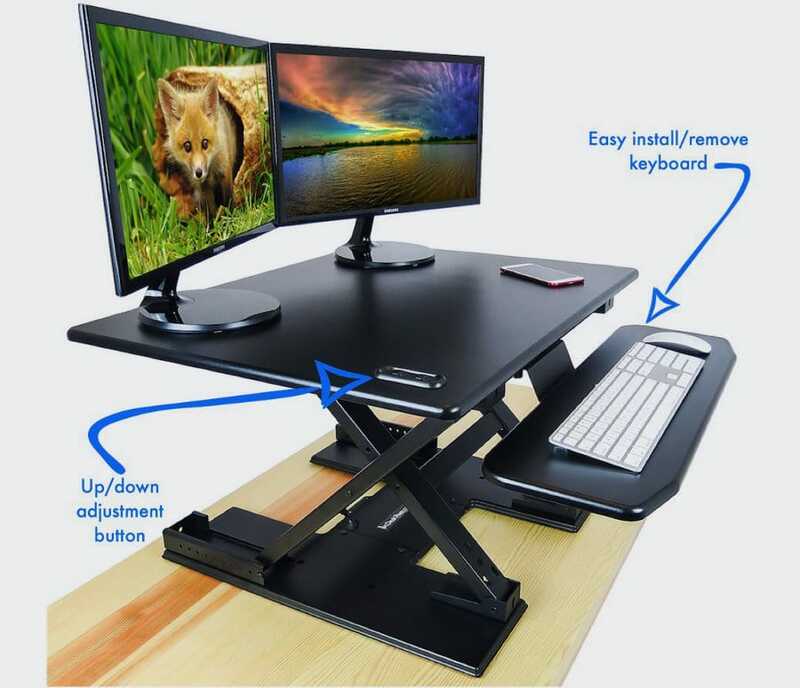 The button is positioned to the left-hand side of the keyboard tray, on the monitor stand, and it brings the desk adjuster effortlessly high enough for users of 5ft – 6ft 5in. This product comes already constructed and ready for use the second that it arrives on your doorstep at work or at home. From that moment the Electric DeskRiser has a full years warranty on the motor of the elevation apparatus and on the general construction of the product. This is a great little special feature for the likes of a standing desk, as a lot of weight gets loaded onto them. 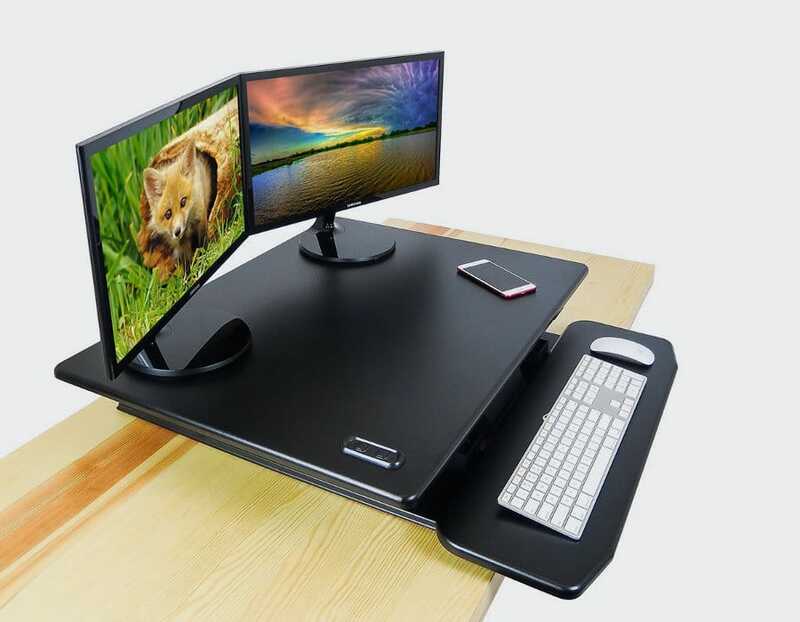 This desk can support up to 50lbs worth of weight and has passed the 10,000 lift and lower test, as is required by all standing desk units for a warranty to be offered. If you a short of space, then the Electric DeskRiser is a good option for you. Rather than a full standing desk, desk converters are much more compact and friendly for office cubicles. This desk will most likely cover the entirety of your current desk, but it is the perfect replacement for this product has a relatively large surface area to work from. The size of the overall product sits in at 31.5inch width, 24.5inch length, and the ergonomic tray that is attached is 27inches in width. Additionally, the Electric DeskRiser uses the x-frame lifting mechanism (rather than a L-frame), meaning the desk will rise directly up and down, saving on the space required if using an L-frame standing desk. Have a look at our standing desk buyer’s guide to find out more about x-frames and L-frames. The Electric DeskRiser is made of a sturdy wood and metal frame that sits at 27lbs atop of your already existing office desk, either at home or work. The frame itself can hold up to 50lbs of anything you choose to add. Being made to take such heavy loads – even as your motor has risen the monitor platform to full height – the product can and does boast a wobble free surface, unlike some of its cheaper competitors. 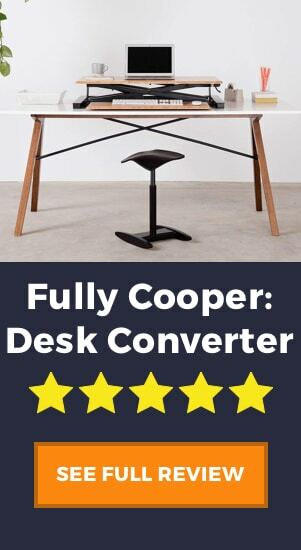 Users say that this desk converter is extremely sturdy, which would rank it among the likes of the Fully Cooper, a premium standing desk converter which is no mean feat. For us, this is an absolute deal-maker! Having a sturdy and shake-free desk it absolutely vital for workplace productivity. As there are many things that make the Electric DeskRiser perfect for some, there are always going to be reasons why a product is not right for in other areas. Here we go into the most likely cause of the cons that need to be held into consideration before purchasing this product. As with many of the standing desks that you will find in your search for the perfect one for you, the Electric DeskRiser from the House of Trade is no exception to the limitations to how high it can rise. This product works best for people at heights of 5ft to 6ft 3inch, while its highest height limit is set in at 6ft5inches. If this is a deal-breaker for you, the have a look at our article on what we believe are the best standing desks for tall people. This desk was designed for taller people, but definitely not the tallest. Height limitations can be a pain in the neck (no pun intended! ), but if you are between 5ft and 6ft3, then we doubt you’ll have any problems with this desk. Also, having the option to take away the keyboard tray and placing it wherever you prefer helps by way of your own comfort. Remember, rules are not always there to be followed! After spending so much time working at a standard office desk, learning where is best for you to place your arms to properly hit the keys can be a little jarring at first. 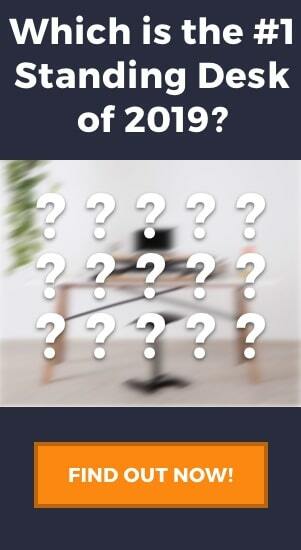 You are going to be fighting against the muscle memory built up over time at a standard desk height, you might feel a little uncomfortable with the DeskRiser. This is not really a criticism of the DeskRiser itself, more of a warning about your first impressions of a standing desk, but trust us the transition is WORTH IT. The shipping weight of this product comes in at 61.2lbs, whereas the actual weight of the Electric DeskRiser is close to a half of that weight, coming in at 27lbs. 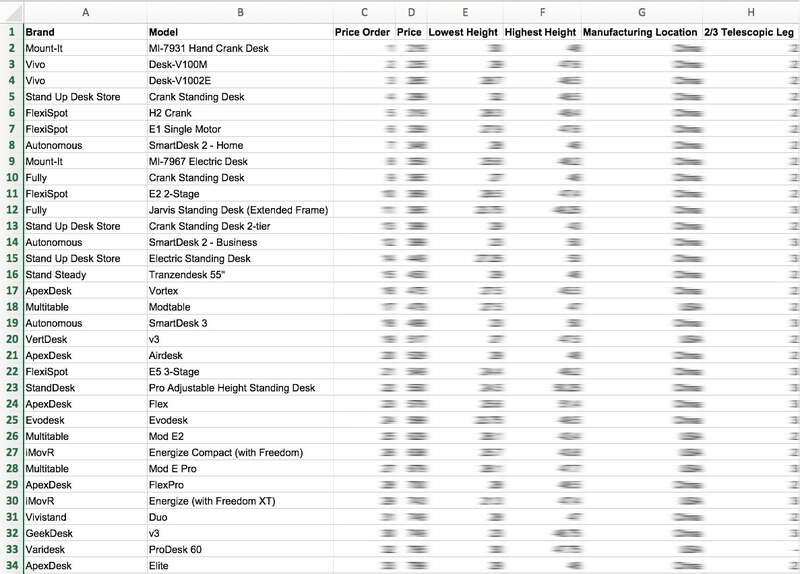 The problem with this is that getting a fully assembled standing desk converter is really fantastic as there should be no heavy lifting, however with the large shipping weight, you should be careful about who will be picking up or collecting your new desk, maybe get a friend to help you out. Always take into account the weight of a desk adjuster, because, from delivery to receiving, a lot of lifting is to be done. The biggest thing that we can say against the Electric DeskRiser is that all of the workspaces found on the desk are fixed into place. There is a button present, as previously discussed, that activates the desk adjusters motor in lifting or lowering the whole piece, but that is the only moving piece of this product. Having a specific slot to place an ergonomic keyboard is a fantastic little feature that the DeskRiser can boast having over its cheaper competitors, but not having the means to adjust its angle is a flaw in the design that costs the product a couple of points. The fixed angles of the keyboard tray limit full ergonomic benefits, but the tray can be removed from the product, as mentioned earlier, which helps in solving this issue. Now that you have been given an in-depth look into the Electric DeskRiser, hopefully, you can see all the advantages of owning this product. 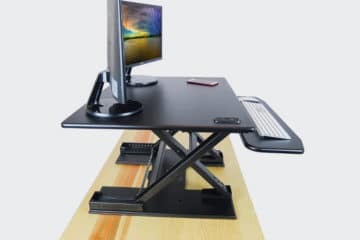 In our final opinion, we think that the benefits of a DeskRiser standing desk converter definitely outweigh the small number of cons that we could find. Overall we believe, along with hundreds of happy reviewers, that the Electric DeskRiser is the perfect addition to your office.